Looking for a great deal on what is still probably the most popular headphone brand on the planet? 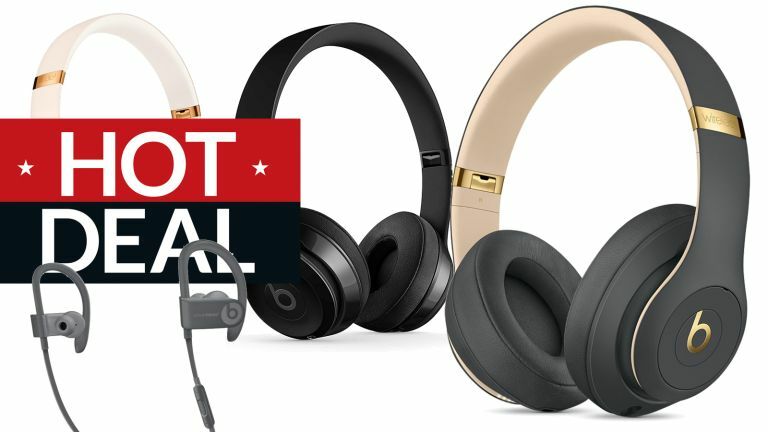 You're in luck, as we know the cheapest Beats headphone deals on the web, and they should still arrive in time for Christmas if you want them as a gift, or simply to drown out the sound of your family arguing. If you're into hip-hop, rock and pop, Beats headphones are a great choice. They used to have a fairly terrible reputation among 'audiophiles' for the quality of their sound compared to their cost but most recent Beats by Dre headphones sound good to excellent. The Studio3 Wireless are right up there with any of the best noise cancelling headphones, and the likes of the brand flagship Solo 3 and gym-friendly Powerbeats are very solid. The pricing on Beats by Dr Dre cans is on the premium side so cheap Beats deals are a perennially popular online search. Good news, searchers: Amazon and Very have some Beats deals will help you have a good 'Dre day' and ensure that you do not 'forget about Dre'. (Those are hip-hop records). Beats by Dr Dre Studio 3 Wireless in very stoosh porcelain and rose gold. Studio 3, sometimes styled Studio3, is by far the best pair of headphones from the Beats by Dre stable. The way they adapt to noise – be it office hum, airplane roar, train rumble, or even howling wind (most NC cans are defeated by this) – is truly impressive. This is the same headphones at a higher price, but wouldn't you say that colour scheme is rather more wearable? We would. And you're still getting a lumpy £50 off the price of the other colours in the range. The Beats for gym-goers, especially those who totally like to lift, bro, Powerbeats 3 hook over your ears like a pair of spectacles (with the actual spectacles element missing). As you'd expect, the sound is pretty pumpin', so fans of acoustic whimsy should look elsewhere. For Spotify Workout No Pain No Gain Playlist #57, it's great. Arguably this is a slightly lesser deal than the above, but it's the best we can find on the iconic, but oft-discounted Solo 3, so you'll have to make do. The Studio 3 is the Beats by Dre flagship: a luxe pair of cans with excellent sound and noise cancelling to rival Bose QC35 and Sony WH1000XM3. The noise cancelling adapts to the sound around you, helping to completely wipe out the rest of the world – the big, pillowy earcups help here, too. It's generally agreed these are the best sounding Beats headphones, but they aren't cheap. Even more reason to look out for a Black Friday deal on them. The Beats Solo3 Wireless is iconic. Instantly recognisable, it's also a well-built wireless headphone that sounds good in both wireless and wired modes. They are comfortable to wear and the battery life provides up to 40 hours of listening time. The remote control built-in to the right ear cup is intuitive and easy to use. But the newest feature is the W1 chip, Apples new Bluetooth technology, that improves battery life and makes pairing the headphones with Apple effortless. As well as the more standard black and white, Beats X is also available in grey and blue. While Apple has all four colours available from its online store, it looks like only black and white are available from some retailers at the moment). The in-earphones were announced just after the iPhone 7, the AirPods and alongside the superb Beats Solo 3 Wireless over-ear headphones, all of which feature Apple’s W1 wireless chip which augments Bluetooth for easy reconnection to your iOS device as well as easy device switching between your iCloud-registered devices. If you're living the active lifestyle and need a lightweight way of delivering tunes to your skull you should consider the popular Powerbeats 3 Wireless headphones. The 12-hour battery life is great for multiple lengthy workouts between charges and the wireless tech is excellent for tangle-free times. There will be some fab deals on the Beats Solo 2 thanks to the newer Solo 3 model. These little headphones are very versatile. They have been designed to fold inwards to make them easy to pack into your bag. The rubber-topped headband creates a firm grip around the head for those who want to wear them running. But more importantly they have some of the best noise isolation through the outer coating creating a seal around the ear. Here we have the first of our wired options, Beats Pro. On first impressions the size and weight of these headphones stand out. Designed for people mixing in studios, these headphones may not appeal to the more casual user. That said, the build quality is strong and these will withstand any clumsy drops or knocks. The headphones are connected through a single cable which can be inserted to either earcup. The spare port can then be used by another set of headphones, allowing you to share music with your friends at the same time. The Studio's 2 are lighter with sleeker edges and greater attention to detail than the originals. One new feature is the rechargeable battery, that gives 20 hours of listening time. If you enjoy classical music or more delicate sounds the subtle hiss when the ANC is on may be a little irritating. Though the sound quality overall has been improved and the bass levels restrained giving a much more balanced sound. The Solo 2 offer a good balance of performance and portability. Significant improvements to the sound quality have been made, though these probably aren't for the audio purists. The cups are on-ear rather than over-ear which could affect comfort and will definitely affect isolation from outside sounds. The earcups rotate so you can do your skillful mixing uninhibited. The bass in these cans is supposed to be particularly 'big' and you can share what you're listening to with dual-port daisy chaining. If you want cheap Beats by Dre, this is as good as it gets really. It's a standard pair of earphones which come with tangle-free flat cables as well as a clicker and built-in microphone for taking calls. These earphones are made for using while exercising. They're designed to not fall out of your ears and they're sweat and water resistant. Meanwhile, RemoteTalk controls allow you to easily take calls or change your music without having to fiddle. Sitting at the lower end of the range and priced accordingly, the lightweight, wired Beats EP headphones are still very finely tuned, which means you'll be able to hear your music just as the artist intended.